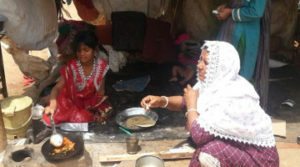 Daily headlines of disasters and crises can overwhelm or prompt us to action. How can we respond well? Open to anyone, this program empowers participants to effectively contribute to global response efforts through knowledge and application of life-saving and dignity-upholding measures as outlined in the Sphere Handbook: Humanitarian Charter and Minimum Standards in Humanitarian Response. Developed by the international response community, the Sphere Handbook puts affected populations and the right to life with dignity at the center of humanitarian response. It focuses on quality, accountability, and collaboration. Interactive sessions contextualize universal minimum standards, key actions, and key indicators and cover four core life-saving areas: water supply, sanitation and hygiene promotion; food security and nutrition; shelter, settlement and non-food items; and health action. Program participants will gain resources to put principles into practice, engage with coordinated relief efforts, minister to affected populations, and maintain resilience. This course is offered by Christian Health Service Corps. 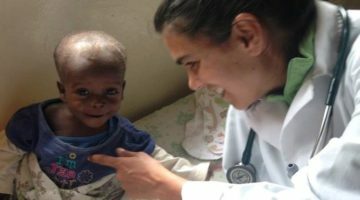 Christian Health Service Corps is a ministry of Christian doctors, health professionals and health educators serving the poor in places that have little or no access to healthcare. Each year, we bring compassionate, life-saving health services to hundreds of thousands of families around the world. Our doctors and health professionals are often the only access to care for young families in poor communities. 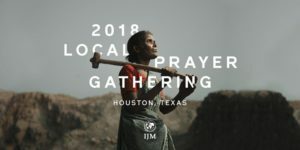 Are you in Houston or the surrounding area and want to join other people to pray for the global issue of human trafficking? There are more than 40 million slaves across our world today. This reality is overwhelming, but we are not overcome. Over twenty churches and dozens of individuals have signed up to participate! The end of slavery begins with God’s people. It begins with you. 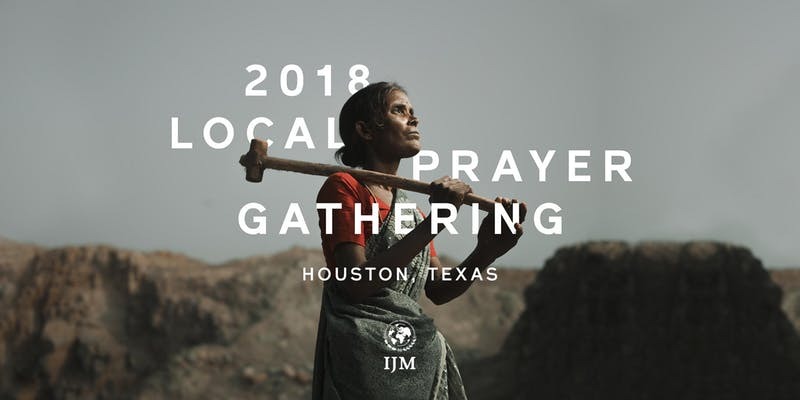 The IJM Houston Prayer Gathering will bring people together to boldly pray for the freedom of every child, woman and man being abused, trafficked and enslaved across our world. Experience powerful prayer and worship, hear stories from the front lines of IJM’s work to rescue slaves and transform nations, and join a community committed to ending slavery and injustice—until all are free. Come prepared for an evening of prayer, unlike anything you have ever experienced. Click HERE to register to attend. International Justice Mission is a human rights organization that is based in the United States. The main goal of the organization is to help victims of human trafficking, bond slavery, police brutality, sexual exploitation, land seizure and other illegal acts. Here is an opportunity we wanted to let you know about for healthcare professionals and students – join CHSC June 25-30, 2018, for our Global Health and Tropical Medicine Overview in Grand Saline, Texas. Healthcare professionals and students – gain knowledge and skills for short or long term international service. This course provides an overview of tropical diseases in a case-based format and highlights the provision of quality care through application of global health guidelines. Sessions on topics ranging from malnutrition to cultural context outline approaches to whole-person care in developing communities. Suturing and physical exam workshops promote practical skills for resource-limited settings. Early registration and student discounts available. Up to 41.5 continuing education credits offered. Click here for details: http://www.healthservicecorps.org/event/global-health-2018/. 2018 M3 Conference Video and Audio Recordings Released! We are excited to announce that the video and audio recordings from the 2018 M3 Conference have officially been released! Here’s a sneak peek at one of the session videos of International Justice Mission’s (IJM) Founder, Gary Haugen, who launched this year’s conference as Friday night’s plenary keynote speaker. If you registered to attend the conference, you will receive an email with a link to these recordings. Finally, you can listen to the breakouts you missed and hear your favorite plenary sessions again. And if you weren’t able to make it this year, follow us on social media and in the following months we will release the 2018 sessions for you to watch too. Be sure to mark your calendars for the 2019 M3 Conference on February 22-23, 2019! We look forward to seeing you there.